Ambitious member of Chamber of Ministers. Leader of Alliance for Global Unity, a.k.a. the Circle. 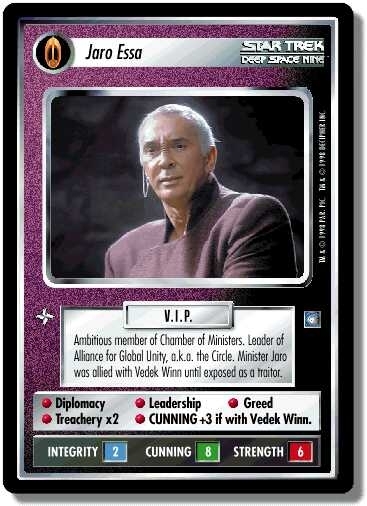 Minister Jaro was allied with Vedek Winn until exposed as a traitor. Treachery x2 CUNNING + 3 if with Vedek Winn. Characteristics: "Reshape the Quadrant"-related cards, affiliation, Minister, "The Circle"-related personnel, Bajoran species. There are 29 entries for Jaro Essa (ST1E 5 R 150) at the Tradeplace (22 haves and 18 wants). Click here to see all trade list entries for this Rare card!